Ethel Smith said that she was born in 1910, but in reality, it was in 1902. Ms. Smith studied piano when very young, and in the 1920s was a theatre organist. 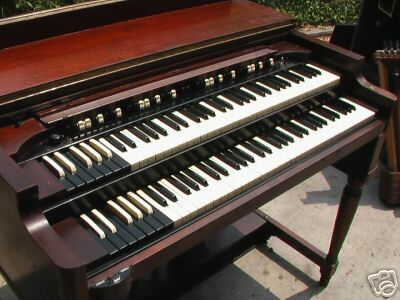 There is an apocryphal story that in the 1930s, just after the Hammond organ was first marketed, she walked past a music store in her hometown of Pittsburgh and saw a Hammond in the window. She went in and tried it and she knew that was for her. Ms. Smith began performing internationally, most notably at Brazil’s Copacabana and New York City’s St. Regis Hotel. In November 1944, she recorded Tico Tico and achieved instant stardom. From 1944 to 1961, she recorded 26 albums. Other famous songs by her were Brazil, The Breeze and I and The March of the Toys. Baby-boomers in the Chicago-area will always remember the theme song from the children’s television program Garfield Goose and Friends, whose theme song was Ethel’s Monkey On a String. She starred in several movies with big stars, but some of the most notable were with “Ms. Fruit Salad Top” Carmen Miranda. Many organists will remember her Blame It On the Samba, when she played it on Walt Disney’s Melody Time. Remember the organ exploding? She was an active performer for over thirty years. Around 1940, Ethel Smith was married, but divorced quickly. In 1945, she married actor Ralph Bellamy, but this ended in divorce in less than two years. She never remarried and had no children. In the mid 1960s, there was a rumor that she had gotten married and stopped playing. This couldn’t be any father from the truth. As stated before, she stopped recording in 1961 and devoted more time to her publishing company Ethel Smith Music Co. in Palm Beach, Florida. This company printed books of mostly Hammond organ arrangements, including her actual arrangement of Tico Tico. Also of note, she published an excellent book of special effects on the Hammond. I still use her train whistle. Ethel Smith had a playing style that was uniquely her own, and instantly recognizeable. She played with such speed that you could not see her fingers flying over the keys. Her left hand was so limber that she did as much with her left hand as with her right. However, my hat is off to her in her pedal work both feet, heel and toe! This is virtually unheard of in popular music and I have only seen a few other organists do it. Her feet were just as fast as her hands. The only area that raised some question was her drawbar registrations, which many people felt were rather bland. Since tone is an individual consideration, I am not going to address this one. Ms. Smith toured the United States giving concerts for the Hammond Organ Company in the late 1970s. She then fully retired. Ethel Smith was truly one of the greats of the electric organ and her legacy will leave its mark on the organ world for many years to come. Some time ago I learned about Ethel Smith's BV being available, then I was informed that it was sold! Guess what showed up in my driveway a few days ago! Seems my family wanted to surprise me! They negotiated with her estate and bought it right out from under me! This is as close as you can get to Ken's old AV. Actually the AV were converts they never produced them that way! The first B's were BV's and this is the organ Ethel used in the movie bathing beauties pretty neat Huh! It does play well - when I get it out of the yard and into the studio I will record with it. Link to TCM's video clip of Ethel playing the above Hammond BV in the film Bathing Beauty. Ethel plays Tico, Tico. N.B. This video clip used be excellent but TCM have made some changes recently and the video only plays in low resolution at present, but you may still find it of interest.